2016 British Collectors Teddy Bear by Steiff. This beautiful hand made piece, in yellow mohair, is fully jointed and wears the white ear tag, signifying this item as a Steiff limited edition, together with the famous gold plated Button in Ear. Limited edition of only 2000 pieces for the UK and Ireland. Product details: safety eyes, synthetic filling material, with growler, size 36cm. Comes boxed, together with a numbered certificate of authenticity. His striking fresh yellow mohair is exceptionally produced and skilfully woven. His deep-set eyes overflow with warmth, playfulness and never ending friendship. 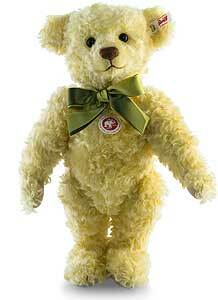 He is a Steiff gentlebear of yesteryear enjoying the delights of today. A bear that is immensely proud to join the celebrated series known as the "Jewell in the crown" of the collectors world.